They may be increasing in popularity, but North Yorkshire Police and the Road Safety Partnership have urged customers to avoid purchasing 'hoverboards' for Christmas. Last month the Met Police tweeted to confirm that the 'self-balancing scooters' could not be ridden on roads and pavements, and could only be used on private property. However, that hasn't had much of an affect on their popularity with many people placing the vehicle top of their Christmas wish-list. North Yorkshire's Road Safety Partnership and 95 Alive York are now also warning potential buyers about their usage on public roads or footpaths. The partnership also encouraged all owners riding on private to do so wearing safety helmets and clothing, such as elbow and knee pads. A statement from the Partnership read: "In law these types of vehicles cannot be registered or licensed and are not covered by any driving licence category, so using them on the road is illegal. "Neither can they be used on public footpaths, including those in public parks. They can be used only on private land with the owner's permission. "For riders travelling at 12mph, coming off and hitting tarmac or concrete could cause serious injury and deep skin damage." The hoverboards, which have one or two wheels and are powered by electric motors, have gained national recognition recently having been used by sports stars and celebrities. The vehicles have become a common sight on streets around North Yorkshire and range from around £200 to several hundred pounds. 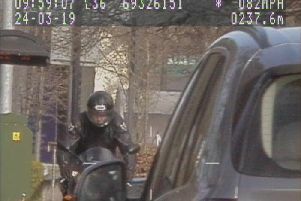 Despite the fact they must adhere to the same rules as Segways under UK law, a Metropolitan police officer was filmed illegally riding one down a London street, days after it was confirmed to be against the law. While Inspector Dave Barf, North Yorkshire Police's Roads Policing Group admitted the vehicles looked 'great fun', he advised parents not to purchase them as a Christmas gift unless they could access suitable private land. He said: "If you plan to buy an air board, you need to be aware that they must not be used on the roads or paths and anyone doing so could be prosecuted by the police. "Many retailers are failing to make this clear to their customers. Worryingly, many adverts are actively encouraging people to use them on the road."